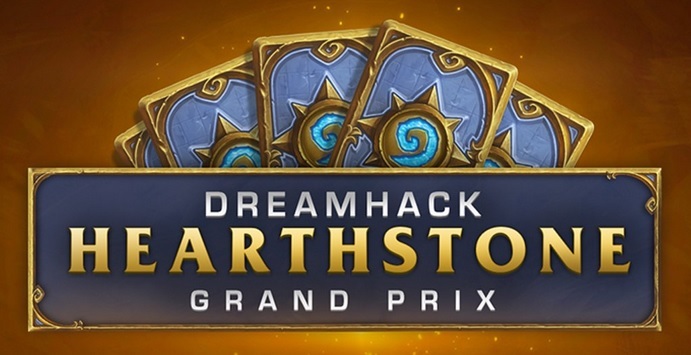 Dreamhack Atlanta 2017 Hearthstone Grand Prix was played from 21st to 23rd July in Atlanta, USA. 169 players participated in this major tournament with a $25,000 prize pool. 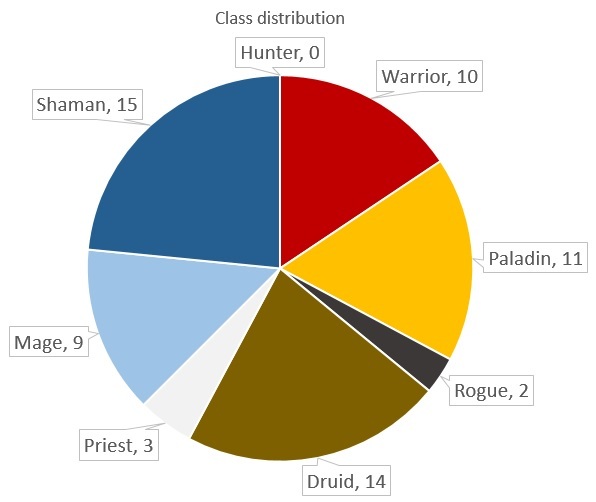 In this post, I take a look at the decks and results of the top 16, including class distribution, archetypes, and archetype performance. The event was played in a best-of-five Last Hero Standing format with one ban. It started with a nine-round Swiss bracket followed by a top-16 cut into single-elimination playoffs. The Swiss bracket was played with closed decks, and the decks were then published for the top 16 playoffs. The Swiss bracket had a relatively clean cut: everyone with 7-2 or better record was in the top-16, and they were joined by one player with a 6-3 record out of 21 players who finished with that scoreline. The top-16 players were seeded into the playoff bracket based on their Swiss results, and the ruthless single-elimination stage began. Round of 16 had its fair share of sweeps, something that is typical of Last Hero Standing format: half of the round of 16 matches ended with a 3-0 scoreline (overall in the tournament, 161 of the 500 matches ended 3-0). However, quarter-finals and the rest of the finals from there were all close, each one ending 3-2. The VOD of top-8 is available here. 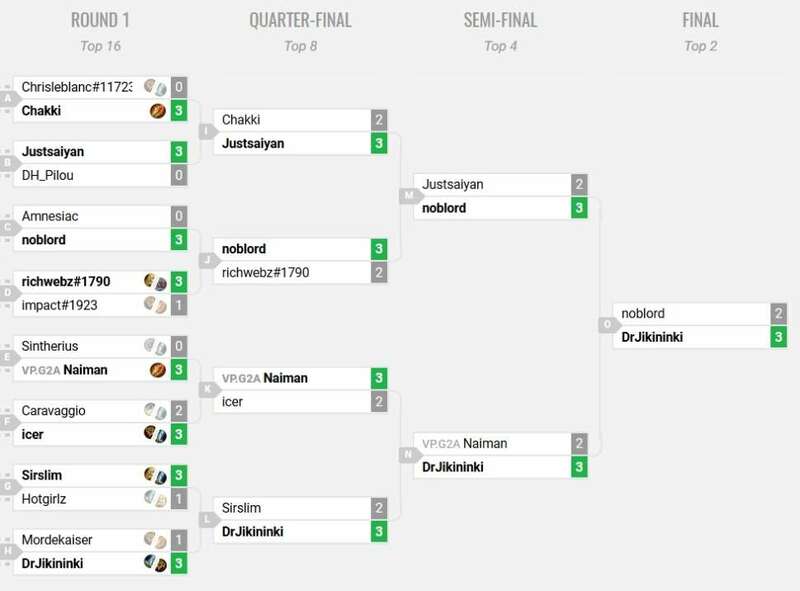 In the end, it was Americas 2017 Winter Champion DrJikininki who prevailed and added a second major title to his resume by taking out Noblord in the Grand Final after a close 3-2 series. The tournament was organized on smash.gg platform, and for the first time for such a large Swiss bracket, we have some statistics available. Looking at the entire tournament, some people were even willing to put their faith in Warlock, a class that has not been seen in serious competitive play for months. Warlock achieved a 29% win rate (2-5) in the entire tournament, so I guess you can argue that it still did not see serious competitive play. On class-level over the entire field, Shaman was the only class to win more games than it lost. It was followed by a close group of Mage, Paladin, Priest, Warrior, and Druid. Three classes were clearly weaker: Rogue, Hunter, and Warlock could not find success overall. However, players use specific decks, not just classes, so it is important to not read too much into these results, as results by archetype are much more significant. The top-16 decklists were published on Dreamhack website. Warlock: Zero. Zippo. Nada. Zilch. Shaman and Druid were extremely popular coming into the tournament and did not give up their top spots coming into the playoffs either. Compared to Dreamhack Valencia a week earlier, the popularity of Rogue kept declining as did its share of the top-16 spots, and Paladin lost just a touch of its popularity as well. The winners were Shaman, which was almost omnipresent, and Priest, which was able to overtake Rogue. First, Pirate Warrior has completely replaced Taunt Warrior. Ten Warriors in the top-16, all of them Pirates. Pirate Warrior has undergone some changes that make it even better against control decks, and it enjoys strong matchups against decks that attempt to return to the game using the space left behind by Quest Rogue’s departure while retaining strong matchups against many other aggressive decks. Pirate Warrior has solidified its position as one of the strongest decks in the game, while Taunt Warrior suffers from the popularity of Jade Druid and Midrange Paladin. Second, Gunther Mage has dramatically fallen in popularity in favor of Freeze Mage. Some if this change can be attributed to hybridization: Medivh, in particular, has become much more common in Freeze Mage, but the decks are not cutting any Freeze effects to fit in these new additions. Freeze Mage was the most popular Mage archetype in the playoffs at five representatives, followed by Secret Mage at three, and one lonely Gunther Mage that also made it to the top-16. Performance-wise, Secret Mage was by far the strongest type of Mage – and deck overall – in the playoffs with its stunning 9-2 record, while Freeze Mage was only able to squeeze out a 5-6 result. Both have their good matchups, but as Secret Mage has kept up great performance for a while now, it should increase in popularity still. Third, Priest has returned to the competitive scene, and it did so with Dragons – all three Priests in the top-16 were Dragon Priests. What’s more interesting is that these Dragon Priests were of the more midrange style and not control style, each running seven or eight Dragons in the deck. Each of them had also been teched to beat Pirate Warrior, a good meta read. Fourth, the search for Jade Elemental Shaman continues. Most Shaman decks in the top-16 were Evolve Shamans, but that archetype has largely been figured out by now. It is still strong, but it can be targeted, and its 2-9 record in the playoffs was the worst performance of any archetype there even while it was the most common archetype. However, Noblord’s Jade Elemental Token Shaman, still a double Bloodlust aggressive deck, but without any Doppelgangster+Evolve shenanigans, racked up an impressive 4-1 score and looked really strong and consistent. I was asked about the effect of Jade Spirit becoming an Elemental immediately after the surprise patch, and back then I wrote: “My initial prediction: After the dust settles, the best build will include Jade Spirit, but will not include Evolve.” I look forward to seeing how Noblord’s list affects the meta. One more observation. Druid is a pretty good class. There were three archetypes of Druid in the top-16: Jade Druid (eight of them, 9-7), Aggro Druid (five of them, 3-1), and Big Druid (one of them, 2-1), and each of them was able to win more games than it lost. Each archetype also made it to top-8, and Druid was the only class in the lineup of every player in the top-8. Unlike Dreamhack Valencia, that took place immediately after the patch, enough time had now passed for players to test things out and make real predictions on the upcoming meta. What we saw at Dreamhack Atlanta was a meta in process of adapting to the latest patch, where some decks had been determined to be stronger than before, others had been abandoned, and work on some archetypes was still ongoing – a much more interesting environment than we had a week ago! Secret Mage was the most successful archetype in the playoffs. The archetype had already showed a lot of promise in recent tournaments, but this time its performance was just through the roof. Naiman’s list was the most successful one, so it is worth examining in more detail. The Secret package is slightly tuned to target Paladin: two copies of Counterspell, one Mirror Entity, and one Spellbender were Naiman’s choice for this tournament. The Secret package is something you tweak to fit whatever meta you are facing, and Spellbender is most effective against Paladin. The deck does not include a lot of tech cards otherwise. Just solid, core Secret Mage cards with one significant alteration: there is Archmage Antonidas together with two copies of Burgly Bully in the deck. This combination gives the deck a good amount of reach to take on control decks. One Babbling Book had been cut to make room for the package. Have you ever dreamed of a deck that can beat a number of aggro decks as well as Mage? Noblord’s N’Zoth Control Paladin could be the deck you’re looking for. If it has healing, Noblord wants it. The deck has been completely proofed against any sort of burn with two copies of Forbidden Healing, two copies of Ivory Knight, and Ragnaros Lightlord. The ultimate win condition – should the opponent choose to not concede when it becomes obvious that there is no way for them to win – is N’Zoth the Corruptor, who will bring back two minions, Tirion and Cairne. Any additional Deathrattle minions need to be the result of secrets from Hydrologists or Discovered minions from Stonehill Defenders. With so much healing and N’Zoth package in the deck, something has had to be cut. There are no Acolytes of Pain or Stampeding Kodos in the deck, and there is only one Primordial Drake. There is a Harrison Jones to provide weapon removal and a bit of card draw to compensate for the lack of draw otherwise. Dragon Priest was one of the rising stars in the tournament. Despite Priest being a rare class overall, three variants of Dragon Priest were piloted to the top-16 by Amnesiac, Chakki, and Justsaiyan. What is particularly interesting is that all three were at the more midrange end of the spectrum. Many Dragon Priest decks nowadays are hybrid Control builds that cut some Dragons and only take the synergy value later in the game. These decks did not want to wait: Amnesiac’s list included seven Dragons, and Chakki and Justsaiyan brought eight Dragons each. Eight Dragons is the safe line for reliable synergy activation in the early game as established during the previous Standard rotation when Dragon Priest was a curve deck, and it can just barely be fulfilled with the current card pool: players brought two copies of Twilight Drake, Drakonid Operative, Book Wyrm, and Primordial Drake to reach that number (Amnesiac cut one Book Wyrm). If building the deck more against Control, one of the slots can also be filled by Ysera, but these lists were focused on beating aggro, especially Pirate Warrior. That said, Dragon Priest has some inherent power against control decks anyway thanks to Netherspite Historian, Drakonid Operative, and Elise the Trailblazer – none of the players cut any of those core cards. Justsaiyan’s list was the least targeted one, and only included a couple of tech cards against aggro: Golakka Crawler, Gluttonous Ooze, and Greater Healing Potion. Amnesiac and Chakki had chosen to tech more extensively against aggro with two copies of Golakka Crawler and Amnesiac with two copies of Gluttonous Ooze whereas Chakki included one copy of Shadow Word: Horror. In order to fit in all the tech cards, Amnesiac and Chakki had chosen to cut Curious Glimmerroots, whereas Justsaiyan was able to include them. None of the decks included Radiant Elemental or Lyra the Sunshard. Justsaiyan had chosen to cut Priests of the Feast and replace them with a single copy of Greater Healing Potion. The Potion gives you more burst healing to stabilize against aggro, but less sustained healing to deal with slow Mage decks, so if you take the deck to the ladder and face a lot of Mages that can be an issue, unless you can find more copies of your potion with Shadow Visions. In addition to the army of Evolve Shamans, there were a few attempts to bring in new Shaman builds focused on Jades and Elementals to the meta. Noblord’s token-based build with two copies of Bloodlust but no Evolves or Doppelgangsters was the most successful one, going 4-1 in the playoffs. The deck is in some ways reminiscent of the double Bloodlust Jade Elemental Token builds that Kranich and Zorkthar created and piloted successfully in early June: giving up the Evolve combo for some powerful minions and one Elemental synergy card, Kalimos. However, Noblord’s build is clearly a new creation for a new meta: the newly Elemental-tagged Jade Spirit plays a central role and allows the deck to create up to 8/8 Jade Golems, something that was not possible earlier. Nonetheless, it is an aggressive deck that does not try to milk all the possible Jade value – there are no Spirit Echoes. Another sign that the build is a new one is the inclusion of Sea Giant. Evolve Shamans started to include Sea Giants to improve the mirror matchup in early July, and Noblord’s creation includes two of them. This gives the deck a lot of late-game power: there are two 8/8 Sea Giants, up to 8/8 Jade Golems, and a 7/7 Kalimos in the deck. When compared to the standard Evolve Shaman build, the deck feels a lot different with just five cards changed: one copy of Devolve has been cut as well as the Doppelgangster+Evolve package, and the additions are two copies of Jade Spirit, two copies of Sea Giant, and Kalimos. Evolve can be a powerful card, but it can also be an inconsistent one. Should a more consistent approach deliver similar levels of power, Evolve is by no means an automatic inclusion. With Noblord’s Jade Elemental Token Shaman delivering such great results, we may be witnessing the start of a shift away from Evolve. Every Warrior deck in the top-16 was a Pirate Warrior. Let that sink in for a moment. Not a single Taunt Warrior made it to the top-16. Pirate Warrior is evolving with the new meta, and there are plenty of variants around. In general, the shift has been towards silence effects and big minions over burst damage from Mortal Strike and Leeroy Jenkins. The decks want to deal consistent minion damage to beat healing from slower decks, such as Jade Druid, instead of attempting to get the opponent within reach of an individual spell. How popular were the various variants in the top-16? Let’s take a look. There were ten Pirate Warriors in the top-16. How many of them featured various non-core cards? Spellbreaker is used almost universally, and the other choices are all over the place with Mortal Strike trailing behind everything else in popularity. If you just can’t decide which ones are the right cards for your deck, you can always use DrJikininki’s build: it includes everything but Naga Corsair, in single copies of course as two copies of everything would never fit. It was also one of the most successful Pirate Warrior decks in the tournament. Richwebz piloted Big Druid all the way to the top-8. The list itself is not a new one, it is the exact same list Ostkaka brought to SeatStory Cup VII in late June. However, the meta has changed, and for the better for Big Druid: there is no Quest Rogue anymore, and Jade Druid has increased in popularity. Big Druid is a rare control deck in that it actually has a favored matchup against Jade Druid: infinite value cannot compete with the amount of tempo Big Druid can push out in the mid-to-late game. In general, the matchups of Big Druid closely mirror those of Jade Druid. Most of the time, it is a little better at defending against aggro, although it is still unfavored in those games. It is also worse against some control decks, as it does not have infinite threats: removal-heavy control decks can actually fatigue a Big Druid – but those decks lose terribly to Jade Druid, so their viability in the current meta can be a little questionable. With Big Druid able to take out Jade Druid, it reaps double benefits from the prevalence of Jade Druid: Jades discourage playing some of its worst opponents while being susceptible to Big Druid themselves. Should Big Druid replace Jade Druid, the meta would shift in response, making Jade Druid more attractive again. Interesting times. Raw data on matches, lineups, and bans. Bans: Chrisleblanc banned ? and Chakki banned UK Paladin. Chrisleblanc 0 – Chakki 3. Bans: Justsaiyan banned Murloc Paladin and Pilou banned Freeze Mage. Justsaiyan 3 – Pilou 0. Bans: Amnesiac banned Jade Elemental Token Shaman and Noblord banned Evolve Shaman. Amnesiac 0 – Noblord 3. Bans: Richwebz banned Aggro Druid and Impact banned ?. Richwebz 3 – Impact 1. Bans: Sintherius banned ? and Naiman banned Evolve Shaman. Sintherius 0 – Naiman 3. Bans: Caravaggio banned Giants Secret Mage and Icer banned Evolve Shaman. Caravaggio 2 – Icer 3. Bans: SirSlim banned Jade Evolve Shaman and Hotgirlz banned ?. SirSlim 3 – Hotgirlz 1. Bans: Mordekaiser banned ? and DrJikininki banned Aggro Druid. Mordekaiser 1 – DrJikininki 3. Bans: Chakki banned Evolve Shaman and Justsaiyan banned Jade Druid. Chakki 2 – Justsaiyan 3. Bans: Noblord banned Evolve Shaman and Richwebz banned Jade Elemental Token Shaman. Noblord 3 – Richwebz 2. Bans: Naiman banned Aggro Druid and Icer banned Aggro Druid. Naiman 3 – Icer 2. Bans: SirSlim banned Freeze Mage and DrJikininki banned Jade Druid. SirSlim 2 – DrJikininki 3. Bans: Justsaiyan banned Jade Druid and Noblord banned Evolve Shaman. Justsaiyan 2 – Noblord 3. Bans: Naiman banned Pirate Warrior and DrJikininki banned Aggro Druid. Naiman 2 – DrJikininki 3. Bans: Noblord banned Evolve Shaman and DrJikininki banned Pirate Warrior. Noblord 2 – DrJikininki 3.